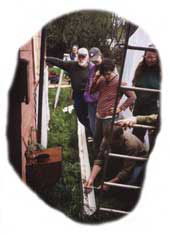 During the permaculture course orchestrated by Food Not Lawns for Whiteaker residents through May and April, 2001, participants were asked to envision "The future of Whiteaker through permaculture." The course ran through six consecutive weekends and was taught by Jude Hobbs and Toby Hemenway, two of the western states' foremost permaculture teachers, who happen to live nearby. Other presenters included Tom Atlee of the Co-Intelligence Institute, and friends from Lost Valley Education Center and Aprovecho. To our knowledge, the Whiteaker permaculture course represents the first occasion in the United States that permaculture certification training has been provided in an urban context, and the first time it has been made available at no/low cost to participants. 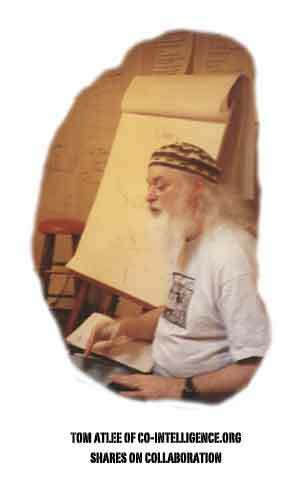 (Typically, permaculture courses run about $1000 a head and involve staying for a week or two at "permaculture centers" in rural areas - a resource and time commitment well out of the reach of the vast majority of urban poor.) Many of our course participants, including long-term FNL volunteers, attended for free/work exchange. 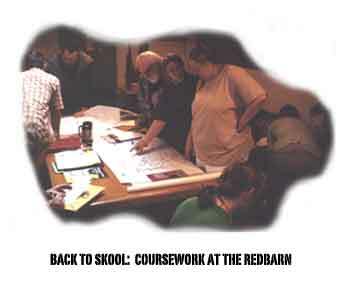 Most of the "classwork" took place in a room upstairs at the Red Barn Natural Grocery, a natural foods store in the physical heart of the Whiteaker district. Fieldwork was arranged in gardens of houses and apartments around the 'hood. A modest grant from the City of Eugene helped cover costs. About twenty people participated, mostly from the Whiteaker neighborhood. Some were experienced gardeners: others had no prior gardening experience. Several participants were single mothers - childcare was provided. Toward the end of our course, one of the course participants suggested the class might envision "the future of Whiteaker through permaculture." Here's what we came up with. The goal of this visioning session? As a point of reference for the class group discussions about the assigned collective design projects (e.g. what can we do together to move towards a collective vision?). The specific questions that were asked of course participants. 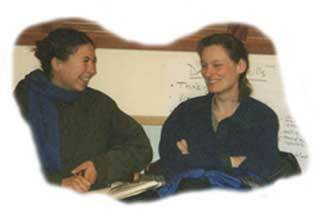 What could Whiteaker and/or Eugene be like in 10 years using permaculture methods? Be specific about sites if you wish. What do you imagine Whiteaker and/or Eugene could look like or in 50-100 years? What is one step we could take as individuals or in this group towards a shared short or long term vision? "Park-like scape between sidewalk and street, bearing food and medicine with short fences to prevent animal interaction; Gutters and rain barrels to water; People out tending and enjoying the landscape, talking and sharing with one another; Increased positivity, includes homeless." "Implement wetlands and water catchment of highways to shower down on plant (not food plants). More fruit and nut trees orcharding (small). Compost stations, take and give. Lots of small self-seeding gardens instead of grass by sidewalks. Mixed with natives." 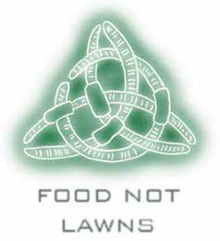 "Food planting by removal of most existing lawn will become common. Medicinal plants will be surrounding people's homes and they will know it. Water will be caught." "Ponds on every other block. Demonstration gardens. Food plants available to all children to munch on. Kids will know what they can eat! Increased biodiversity. " "Narrow all streets to bike cart size. Food, fiber, fuel, community sufficiency." "Lawns to gardens. Food growing in the parks and around parking lots. Everyone has a garden. Harvest share. Free skool continues." "Active comfortable community space with gardens, kid space, gathering areas for classes, meetings, dinners, venue for entertainment, permaculture demonstrations site." "Organized water collecting with several large cisterns to supply much of water for neighborhood gardens." "Neighborhood market for trading/giving/selling plants and food." "More people would have yards, parking strips, etc. planted to permaculture, fruit, herbs, trees, crops, etc. Plantings in public areas of useful crops, etc. More community (open) gardens and spaces. Alleys planted. Network of gardeners more solid and organized. All of this well down the road"
"Streets and parks full of edible trees and shrubs so people could just stroll down the street, snacking as they go or finding food if they were hungry." "The landscape in ten years? Edible! Yum!" "A national model for people to visit. Community greywater recycling, no food waste, all of the lawns to gardens, riverfront food forest in process, no cars in large areas, its impossible unless people stop vilifying each other." "More trees shading streets. A community education building - maybe Whiteaker school with luscious gardens in that huge plot out back. Vacant areas helped into wild lands. The community gardens expand to meet the needs of people." Local midwives and healers, communcal medicinal herb gardens with plaques listing remedies. If there was no dam or reservoir, it would be water, all water. Terrace gardens on all hilltops. A canoe community. Fjords, wetlands, rice paddies. Fish culture. Full of wildlife and a few hunter-gatherers. With rising costs and rapid loss of natural resources, alternative housing will be seen as necessary. Roads will be lifted in lower traffic areas. Guerilla planting of food and medicines. Salmon leaping in the River, Parks, Gardens, Trees, Meadows, everywhere! A forest of Grand fir (N) and Madrone/Incense cedar (S) on Skinners Butte. Links to South line ridges from River. Amazon Creek restored. Millrace link. No 6th and 7th Ave freeway (union with downtown). Sustainable life styles, free clinic, barter network, no car areas, toolshare. Highly productive human forage edible/useful plant-rich ecosystem. Towering trees everywhere. Abundance of benches or little covered areas for community socialization/hanging out. Fruit and nut trees, berry bushes, scented flowers, less flowers, less lawn, fewer cars. Rooftop gardens for business/industry. Water harvesting for business/industry. Gardens as a result of reduced parking lot size. It is really difficult for me not to imagine it completely paved and militarized. A fantasyland could be a fully self-sufficient ecological community; but only so many people will fit in such a small area - the more beautiful it is, the more endangered it becomes. Remove many of the streets - main transport is by bike. Have access routes for bringing/taking loads of stuff with trucks. People in the outdoors out of their houses, away from t.v. 's, working, playing, enjoying, socializing and helping each other. Enough food being grown to feed everyone. We take care of our waste and water. The sewer system is pretty much non-existent. Lots of plant story levels and micro-climates - sort of street jungle. The pumping of resources will stop and we can get our power from water, sun, methane and waste. Removal of roads and limitation of major traffic veins through neighborhoods, with neighborhood council control, park, food, fruit, large community hall with food storage for community crops and weekly trade fair. Less concrete. Cob or alternative dwellings starting to be lived in on most blocks. Vines on most walls. Ponds everywhere. This neighborhood, a centre of biodiversity world-wide. Bigger yet, increased community conversations and links between diverse cultural groups. Wildlife co-evolving with humans. Humans co-evolving with plants. Water reuse and catchment, ponds, edible landscapes, less cars, more bikes, food growing in parks, community space, free skool, neighborhood market, community compost, people will know plants/community education, Whiteaker as a national model, less hunger, natives mixed with edibles, self seeding gardens, kids involved. Water everywhere, abundant food and wildlife, community cooperation, street jungles, closed loop energy systems, many streets gone minimal car use, sustainable lifestyles and livelihoods, salmon in the streams, fish culture, water harvesting for business and industry, Whiteaker as a world-wide center of biodiversity. Guerilla plant trees and shrubs. Hold the intention of seeing the neighborhood evolve towards a permaculture hood while working on individual design projects. Help people start water catchment systems. Dig ponds, plant trees. Share. 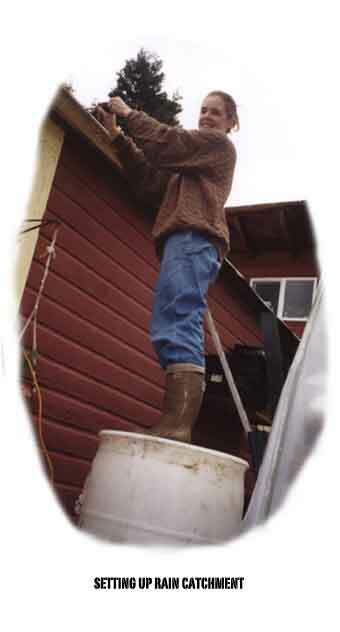 Act as an example by utilizing water catchment, techniques in non-commercial herbicide treatment, organic gardening, spreading love and growth. Concentration on learning to live communally. Refocus on group not immediate family. Short term: construct and determine efficacy of residential water harvesting system. Long term: send water harvesting statistics to the business administration. Survival Education (species), food, sustainability, mental health, political re-education. Happening already. Plants everywhere. Teach skills. Plant lots of fruit trees. Grow, grow, grow. Teach others, help others grow, grow, grow. We can only change the world by helping the people that live in it. Create ponds for wetlands or compost. Educate about our resourcefulness and impact. Guerilla gardening as learning and community building activity of area between street and sidewalk. Block compost bins, seedball scattering. Long term: talk to the neighbours about viision and work together as permaculture blocks. Get kids involved. 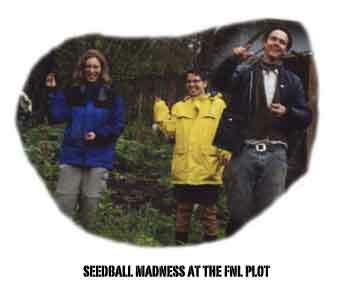 Short term step: organize a neighborhood permaculture course. Grow plants. Long terms steps: Move away so there's more room for the people who want to deal with each other. Make an example/demo site to show people what is possible. Share ideas with people with positivity and respect. Work to create good relations with neighbors/grow food and give it away. Offer to help others do the same.